Sure, a mighty retrospective spilling into adjacent galleries can be quite a treat, but at times a few choice works are all that’s needed for an important exhibition; and that’s what we have now with Jacopo da Pontormo (1494-1557) and a small but elegant show that opened Tuesday at the J. Paul Getty Museum in Brentwood. 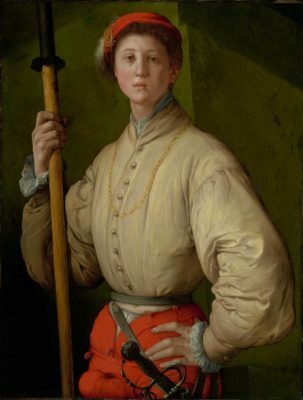 Pontormo’s reputation was, and probably still is, as a religious painter and portraitist. How much evidence does the viewer require in order to sample the very best of each genre? Well, exactly what’s on view here. Despite the scholarly text in the catalog that accompanies the exhibition, there remain several ifs and maybes, but it’s (relatively) safe to say that Pontormo’s “Visitation,” “Portrait of a Halberdier,” and “Portrait of a Young Man in a Red Cap” were created between 1528 and 1530. This was in the period just after the expulsion of the Medici from Florence and somewhat before their return to power. Turbulent times, during which Pontormo kept a low profile. Although the “Portrait of a Halberdier” has been in the Getty collection for 30 years, the other two paintings seem to have dipped in and out of the public eye. 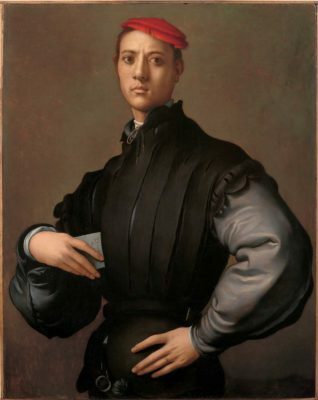 The “Portrait of a Young Man in a Red Cap,” for example, was “rediscovered” in 2008 before being restored in 2017. But what hasn’t been rediscovered is the subject of the painting: “The young sitter’s identity had been forgotten by the seventeenth century” (but quite likely it’s Carlo Neroni). For that matter, the picture itself had been attributed to another artist. For all that, the “Portrait of a Young Man in a Red Cap” is a stunning work, now making its debut in the United States. It should also be noted that, by way of Giorgio Vasari, whose “Lives of the Artists” is the essential resource, the true identity of the Halberdier remains uncertain. “In sum,” writes Bruce Edelstein, in what is a demanding and thorough essay, “the arguments by scholars in favor of one identification or the other ultimately come down to how one reads Vasari’s account of Pontormo’s oeuvre. Is the painting of Francesco Guardi around 1529-30, or is it a portrait of the young Duke of Florence, Cosimo I de Medici, in the autumn of 1537?” Most votes tend to favor Francesco Guardi, but you never know. The subject of the “Visitation” is the encounter between the Virgin Mary and her cousin Elizabeth, as recounted in the Gospel of Luke (1:39-45). If you’re wondering if it’s the “miraculous encounter” of the show’s title, the answer is yes but it equally applies to the temporary reuniting of the works on display, much like an unexpected reunion among friends who haven’t seen one another in half a century. 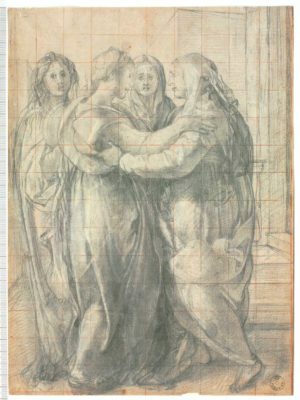 The “Visitation” and the only known preparatory drawing for it had only been shown together once, and that was almost 80 years ago (likewise, the “Visitation” and the “Halberdier” had also only once before been on view together, and that was in 1956). Mary, pregnant with Jesus, is about to embrace Elizabeth, pregnant with John the Baptist. The future saint in Elizabeth’s womb was supposedly cleansed of original sin by the proximity of this encounter, but, alas, I always picture him as the victim of Salome’s whim, and his head delivered to her on a silver platter. But that, as they say, is a later chapter in the book. The “Visitation” is actually a curious picture in that two other women stand behind Mary and Elizabeth and face us, the viewer. This creates a charged dynamic, that’s for sure, but who are these women? Well, presumably they are attendants or chaperones, but another intriguing notion is that, rotated 90 degrees, they are also Mary and Elizabeth. The main reason this isn’t completely farfetched is because these attendants seem to resemble the two saintly ladies. Be that as it may, the colorful and billowing drapery that encloses this quartet might also suggest some kind of rare flower that’s just about to bloom. 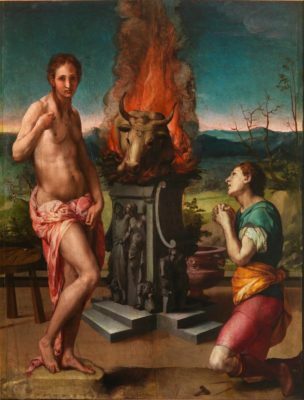 Vasari, who at the time had a nose for what was being created, doesn’t mention the “Visitation,” and there’s been speculation that he suppressed mentioning it because of its political content or implication, or because he had some beef with Pontormo. He did, after all, characterize Pontormo as being a little eccentric (but what true artist isn’t?). The most plausible explanation is that Vasari simply didn’t know about the painting. 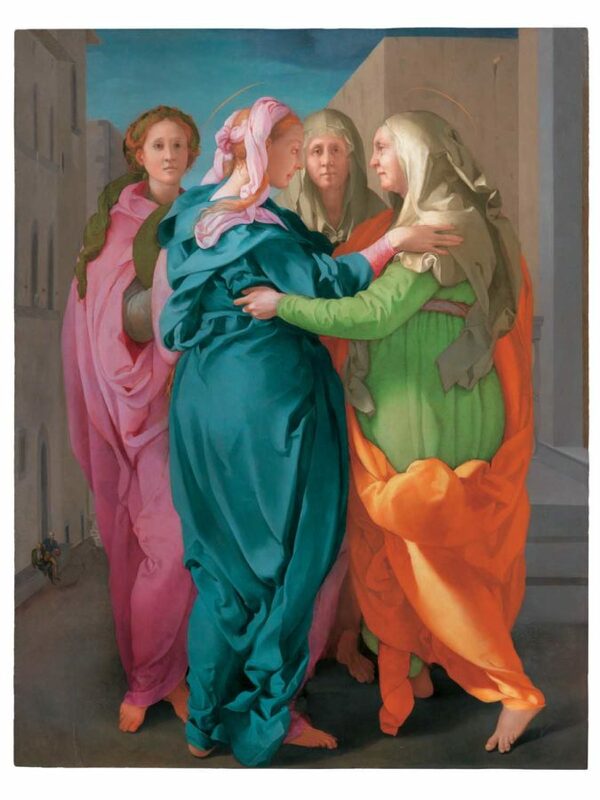 An analysis of the restoration of the “Visitation” is presented by Daniele Rossi in the catalog, which may be of interest to those who are curious about how these 500-year-old masterpieces are conserved and preserved so that, when we see them, they look like they just stepped down from the easel. When the “Visitation” was cleaned, the head of a little donkey appeared on the far left, alluding, perhaps, to Mary and Joseph’s mode of transportation (today we have Mustangs and Broncos; they had donkeys). For that matter, husbands Joseph and Zechariah can also be discerned in the distance, perhaps chatting about sports or politics. 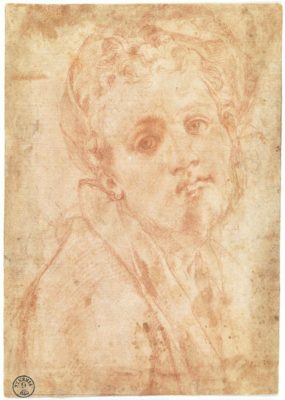 “Miraculous Encounters” is rounded out by Pontormo’s self-portrait in red chalk, a study for the “Halberdier,” also in red chalk, and a two-sided drawing entitled “Studies for a Portrait of an Armed Youth,” this one, however, in black chalk. With the latter drawing we have yet another individual of uncertain identity. Lastly, this show includes “Pygmalion and Galatea,” a painting by Pontormo’s pupil Bronzino, which served as a cover for the “Portrait of a Halberdier.” If paintings, reunited after many years, have the uncanny ability to resonate with one another when again in each other’s company, this is one show in which that could happen. Rare and precious, this is one of those small but focused gems that the Getty has so often conjured up for the delight of the few and the many.